When new web pages and updates are available on the site. Keeps you up-to-date with new postings or news. It might be a new pergola plan, a not-to-be-missed, fantastic offer on a particular tool, or beautiful plant that I really must tell you about! Gives information on landscaping projects that I have done for clients, which will give you an insight into pergola designs and ideas, or garden landscaping in general. 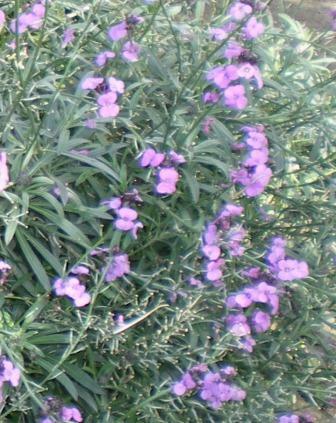 Lets you know when my 'Love Gardening' Ezine articles are sent out (in case you don't like to give your e-mail address, or through over-filtering, causing you to miss an issue)! If you are not sure what RSS and blogging is all about, click on the '?' next to where it says 'Subscribe To My Blog Posts'. Once you start, you will be amazed at how RSS delivers the information you want to see. Continue reading "Fantastic Pergola Offers"
Continue reading "Vinyl Pergola Kits"
Continue reading "Pergola Swing Bench"
Continue reading "Pergola Questions and Answers"
Get ideas for different wooden pergola kits. 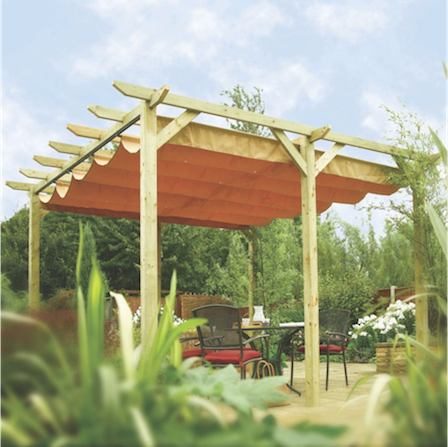 Be inspired by some wonderful designs and styles, and find out where to buy your pergola kit. Continue reading "Wooden Pergola Kits"
Pam and Brian sent over this photo of their fantastic attached lean-to pergola, and what a brilliant job they made! These are the original plans. It's easy to see how they come from the same plan, although the plans can be adapted to make any lean-to pergola of any size or shape. It shows how they adapted the plans to create something that fitted perfectly in their space. It has created this amazing outdoor room attached their house, one I'm sure they use a lot, right through from spring to autumn for relaxing and parties! Continue reading "Pitched Roof Hexagonal Pergola"
How to adapt the corner pergola plans to build a fantastic triangular pergola based on the original design. 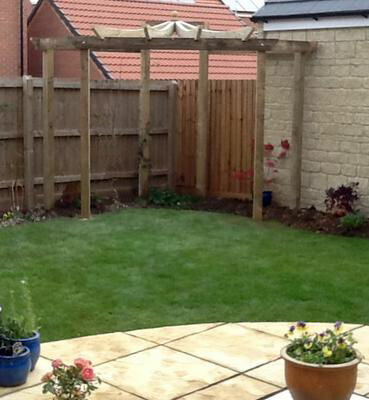 Continue reading "Pergola Planting Hanging Baskets"
James built this excellent pergola and shared a picture with us. Doesn't it look great! 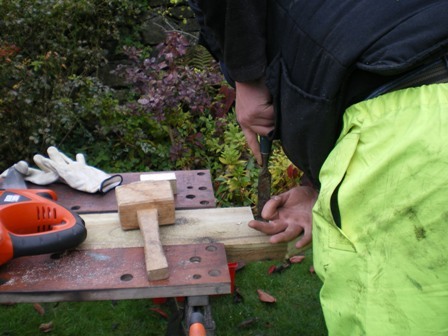 We often know, when setting out on our pergola building project, whether we are going to use a pergola kit, or go the whole hog and get down and dirty in the sawdust. 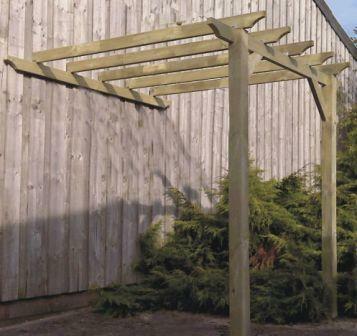 Often we can find pergola kits to suit, and if you'd rather put something up rather than making from scratch, a pergola kit can save time, and be an ideal solution. Building your own may be more up your street, though - the challenge, the sweat...! 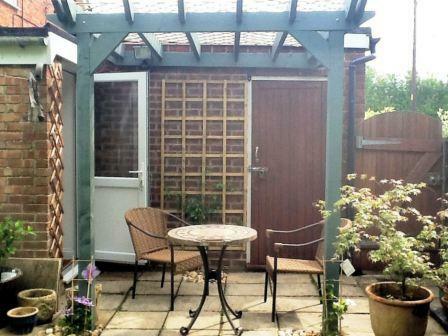 And, of course, there are those awkward to fit spaces, which is where a DIY pergola comes into its own. In which case, use either the free pergola plans, or the arbour pergola plans. 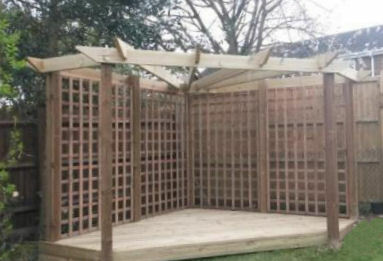 So if you wanted a similar manufactured pergola kit to James's DIY pergola, here is that very one. It comes as a standard pergola, an arch, a pergola with deck, and with attached trellis, too. 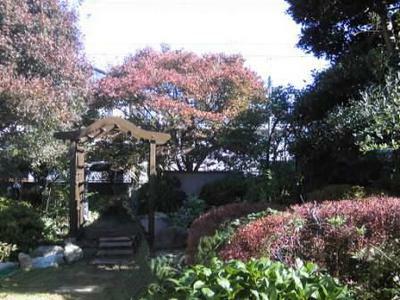 Even though most people would use this as a patio pergola in their garden, this one is shown as a walkway. Imagine it with flowering roses and clematis climbing over the rafters. Beautiful. And the smell! 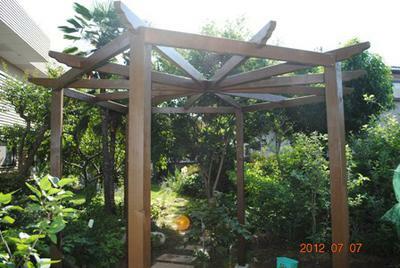 Continue reading "James's Pergola Pictures"
Wow, isn't this great! We've had five new pergolas recently. They should all be very proud! 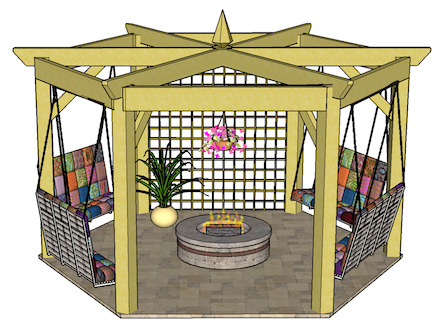 Continue reading "Exciting New Pergola Pictures!" Continue reading "Tips For Building Your Corner Pergola "
What about this for a hanging bench! One of the best things about this bench - apart from it being ever so romantic! - is the fact that it is plastic dip-coated (so no rust staining the crinoline). Metal can be fashioned into such intricate designs, and this is the epitome of traditional beauty. Now...exactly where could I hang one of these, do you think? If you'd like to build Kevin's lean-to pergola, or one similar, and create a fantastic outdoor room in your own back yard, here's how to do it, with the pergola plans for beginners! 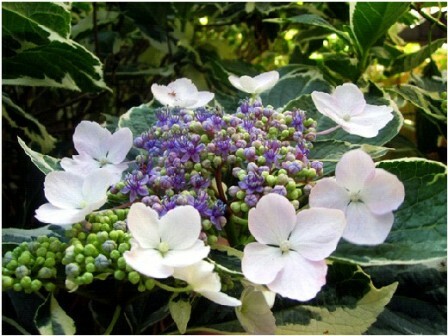 Continue reading "Kevin's Lean-To Pergola"
Continue reading "Attached Lean-to Pergola"
Continue reading "Pergola Planting - Hydrangeas"
Continue reading "Proud Pergola Owners"
If you'd like a fabulous outdoor room for a fantastic price, these pergola kits might be just the job! 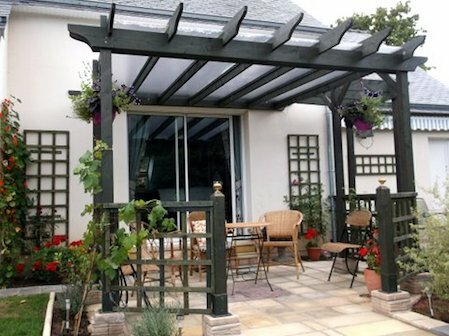 Lean-to pergolas and canopies are two most popular designs at the moment. Lots of people ask me to recommend pergola kits in these styles (or how to build their own! 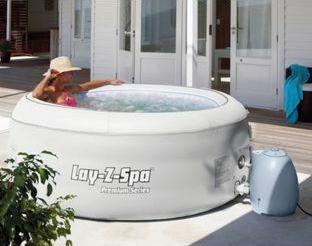 ), where they can relax in the sun and have BBQs with friends. I came across these the other day. They are well-made, with sturdy posts, planed and treated timber and well balanced rafter tail ends. 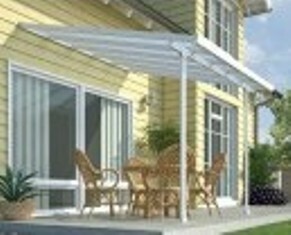 Of course, being manufactured pergola kits, all the cutting and notching is done for you, which is handy. 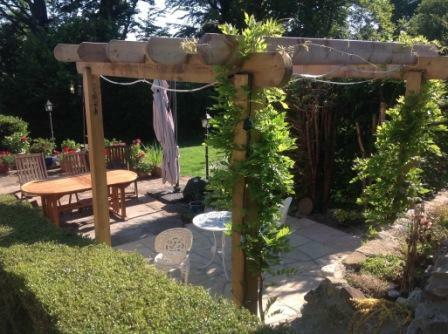 The most surprising part was the price - need a good quality, cheap pergola to transform your garden instantly...go for it! 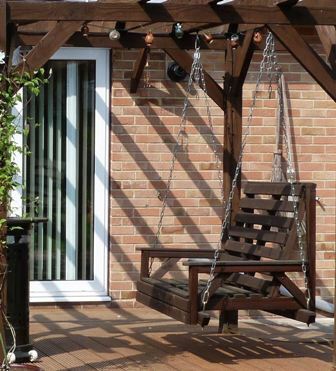 Beautiful Swing Seat for an Arbour or Pergola! If you are thinking of building a lean to pergola, or swinging arbour, one of these wooden swing seats is just the job. They are not always easy to get hold of. I found this one, with the metal arm rests when I was searching for other pergola 'stuff', but, because of the time of the year, this example is no longer available, although there is this entirely wooden pergola bench (a little more like Jeff's in the picture below) in either 4ft or 5ft lengths. 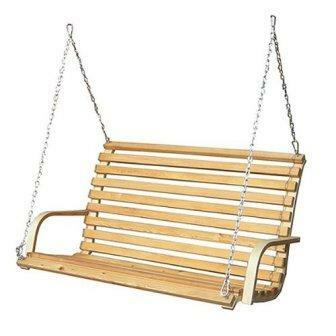 They make fantastic porch and patio swings. Everyone will want a go! They really are a heavenly place to relax. Jeff attached one to his lean to pergola, and it looks a treat. You may have seen it already. 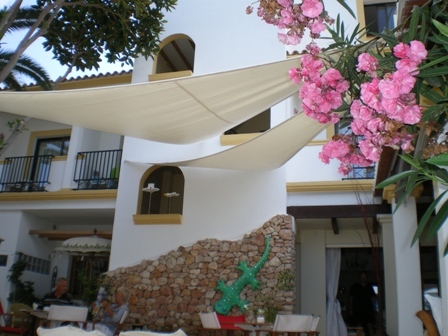 He made the area very special by using interesting accessories and furniture, lighting, a patio heater and souvenirs from his holidays...and the hanging patio swing. Of course, the bench swing is the main attraction! ...hang the swing instead. Easy Peasy! 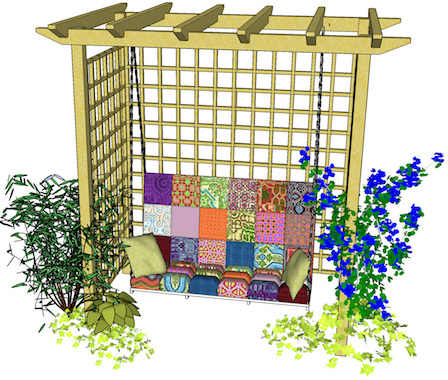 Continue reading "Beautiful Swing Seat for an Arbour or Pergola!" 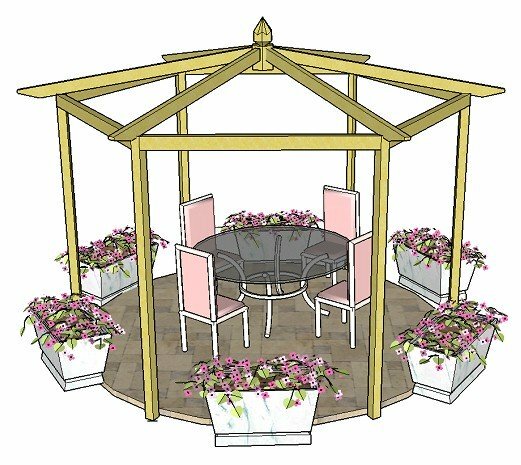 Create this wonderfully romantic arbour with seat from the step-by-step seated arbour plans, part of the 'Additional Plans Series'...an arbour with bench that's both beautiful and functional! 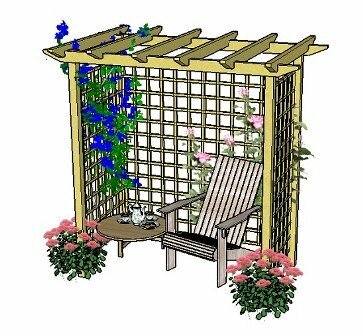 Continue reading "Seated Arbour Plans"
Continue reading "A Patio Circle for a Pergola"
I need a canopy for a pergola to provide shade. What's the best way to achieve this? Continue reading "Canopy for a Pergola"
Continue reading "Metal Pergola Kits"
Half Price Attached Vinyl Pergola Kit! 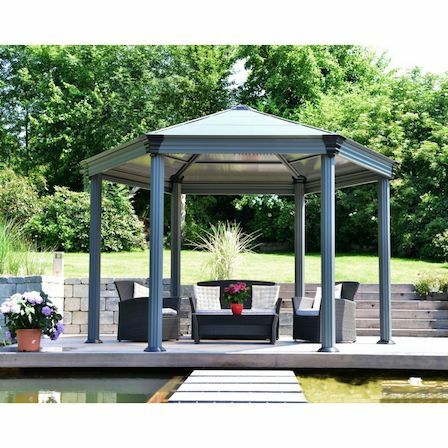 At last we have an attached vinyl pergola for sale online, in a variety of sizes. About time too! Lots of you have asked me for this information over the years, and now we have just the thing. 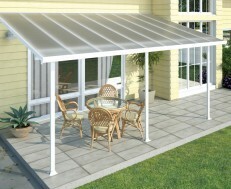 Coming in several lengths, this vinyl pergola has sturdy polycarbonate roof panels, with the option of side panels, too. It's ticking all the boxes for many of you who've emailed. We all love to have a great time in our gardens, basking in the sunshine and eating al fresco under our pergolas or gazebos with friends. This will help you create a fabulous area to do just that. Trust this will answer a lot of questions. No room to attach a pergola ledger board over your window? 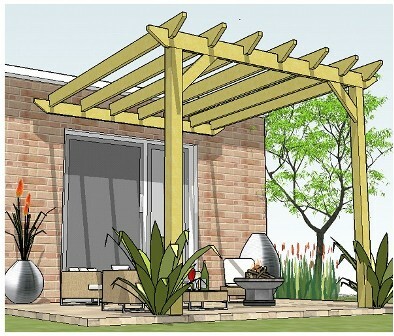 Frustrated that you can't have a fantastic attached pergola to create an outdoor room in which to relax and entertain? Continue reading "How to Attach a Ledger Board Over a Window"
In this Love Gardening! 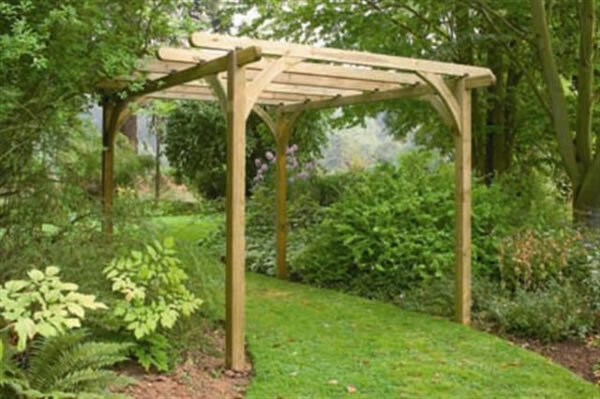 newsletter we take a look at some interesting pergola pictures to give you inspiration to build your own, with a bit about pruning and plants, too! Continue reading "Plants, Your Pergola Pictures and Pruning Tips"
Pergola pictures can be a great source of inspiration! Take a look at some fabulous DIY pergola and pergola kit ideas. 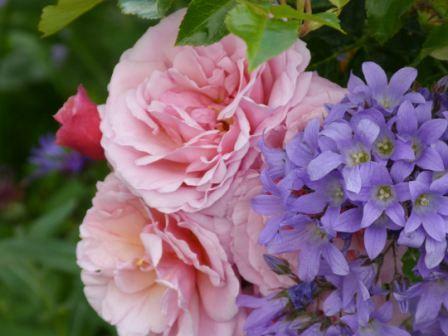 Continue reading "A Rose Arch for the Mother-In-Law!" Rob made this hexagonal pergola video of his son building it from the plans...he is only 2 1/2 years old! Continue reading "Hexagonal Pergola Video"
These Pergola Plans Really Are For Beginners! Continue reading "These Pergola Plans Really Are For Beginners!" A Simple Landscaping Project on the Sly! 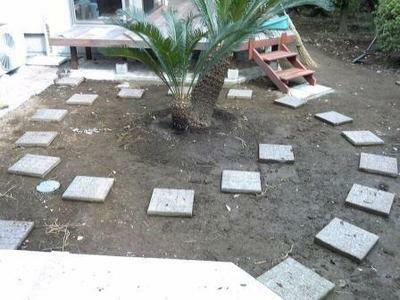 Continue reading "A Simple Landscaping Project on the Sly!" Exclusive Voucher Codes and Cracking Offers! Here are the updated offers for the new season. There are some that are really worth taking a look at! Whether you're going to be working hard in the garden, planting, building things, entertaining or just spending lazy days in the sunshine, do check here before you buy. The voucher codes can make a big difference to what you spend, and there are some terrific offers on all sorts of items. Hope you enjoy the springtime and warmer weather! Continue reading "Exclusive Voucher Codes and Cracking Offers!" Really easy to grow, fabulously tasty in salads, stir fries, and beautiful as a garnish, learn how to grow wonderfully healthy pea shoots all year round, and harvest them in only two weeks! 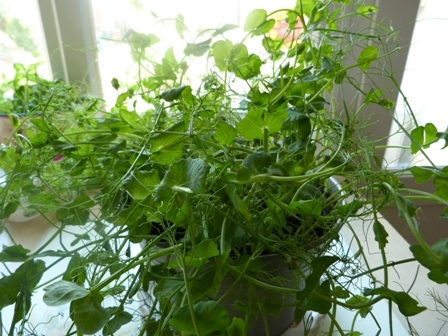 Continue reading "How to Grow Pea Shoots"
Create a superb and delicious display with a vertical vegetable garden. 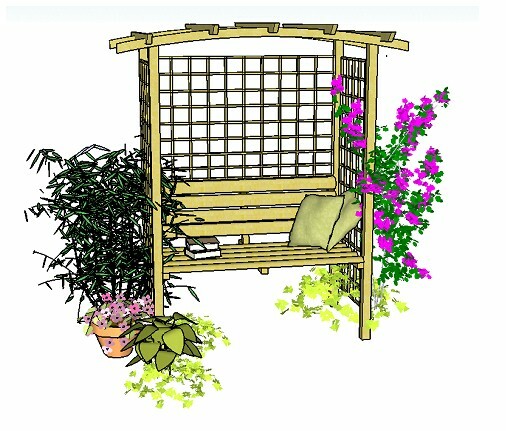 Ideas on how to clothe your pergola, trellis and pots with wonderful, healthy climbing vegetables! 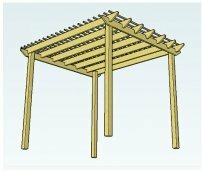 Find out how to make pergola rafter tail template modifications to fit your 8" and 10" support rafters and beams. Continue reading "Rafter Tail Template Modifications"
If you fancy a feel of the Mediterranean in your garden this year, a grapevine might be just the thing! 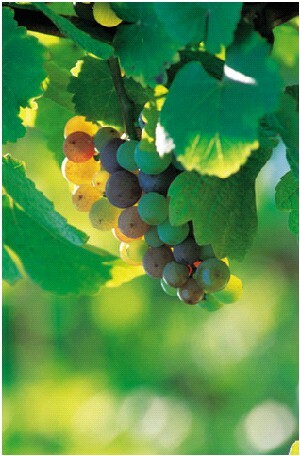 Many readers ask how to grow grapevines successfully. Find out from a professional grower how to plant grapevines for maximum yield, and how to grow grapes successfully anywhere in the world on both a small and large scale - from a single vine in the garden to a fully stocked vineyard! Used either simply to provide welcome shade, or for the fruit they bear, grapevines are an attractive climber for a sunny and sheltered corner. 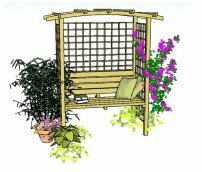 If you need something to support your grapevine, discover how to build your own pergola from the free plans, or source an easy to build manufactured pergola kit. 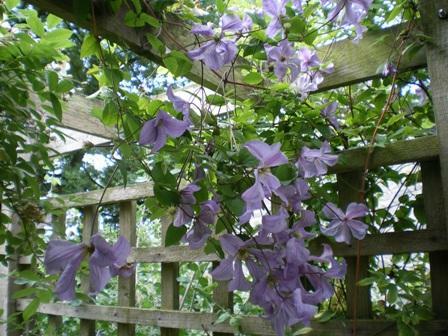 Early spring is the ideal time to plant these fabulous climbing plants, and, finally, spring has sprung! 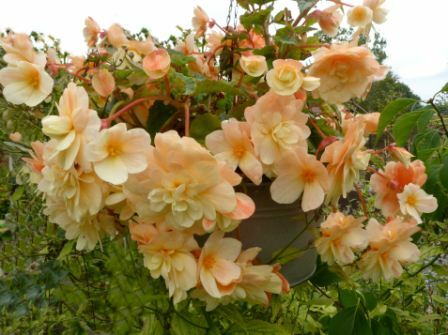 Continue reading "How to Grow Grapvines"
This seems such a great cause - helping to raise money for Greenfingers Hospices when buying from Rowlawn. They are offering 5% off for those who participate. Friday 8th March is Garden Re-Leaf day. 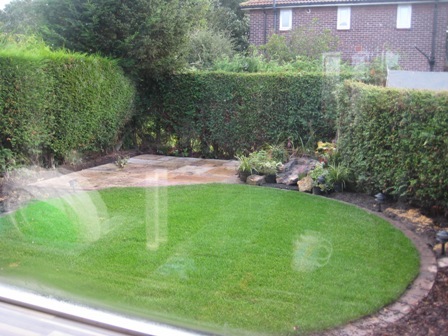 In 2012 the garden industry very successfully launched its own version of Comic Relief and Sports Relief with Garden Re-Leaf. The purpose is to raise money for Greenfingers, the charity that creates magical gardens for children's hospices throughout the UK. Greenfingers is Rolawn's nominated charity and so to support Garden Re-Leaf day we will donate 5% of the value of all orders placed on Rolawn Direct from Friday 8th until midnight on Monday 11th March 2013. In addition, all customers who place orders over this period in support of the charity will receive a 5% discount. The discount code is RELEAF13 and is valid from Friday 8th March until midnight on Monday 11th March 2013. 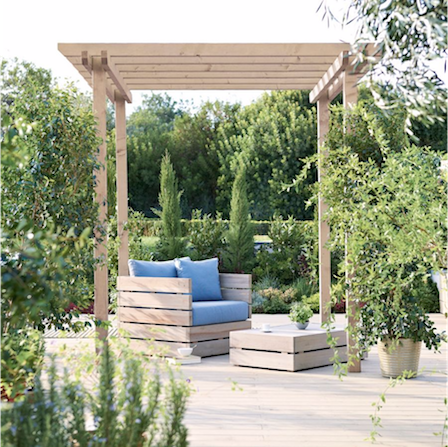 Explore pergola designs and ideas using the DIY pergola plans, pergola kits and pergola pictures to show the many opportunities for creating a fantastic outdoor space! Continue reading "Wonderful Pergola Designs"
John's attached pergola lean-to is a fabulous example of a DIY pergola made from the step-by-step plans! 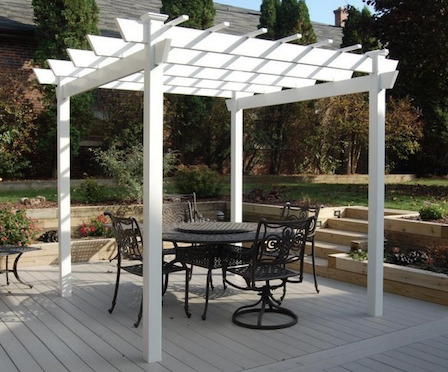 Continue reading "Attached Pergola Lean-To"
Need to adapt the corner pergola plans to fit on your patio? Here are two fabulous examples of how it can be done! 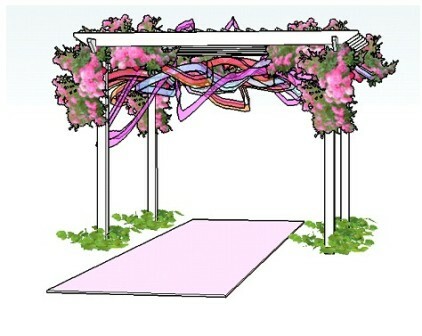 Continue reading "Adapt the Corner Pergola Plans"
Is it possible to build a wonderfully romantic wedding bower from the free pergola plans? 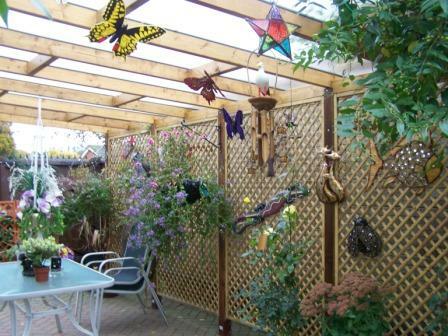 Find out how to do this, with ideas for both DIY pergolas and fantastic pergola kits! Continue reading "Build a Romantic Wedding Bower"
Continue reading "Corner Pergola Climbing Plants"
Continue reading "Planning Permission for a Pergola"
It's the middle of January and we're faced with beautiful snow scenes - very pretty, but not good for building pergolas! I'm taking this opportunity to keep all snug and warm, and more importantly to finish off some new seated arbour plans that I've been working on for some time. Lots of visitors to my site have asked for this type of arbour: one that has an integral seat. Eventually I began work on the plans when someone especially asked for a seated arbour with curved rafters, where he and his Mum could feel close to his Dad when sitting in the garden. It was important for him to be able to create it himself. What a lovely idea. It was such a touching request that I started straight away, and more plans were born. I'll keep you posted to let you know when the plans are ready. It shouldn't be too long - hopefully! Pergola awnings are an ideal way to create a fabulous outdoor living space, providing shade from the sun, protection from the weather and an ideal place to relax and unwind! 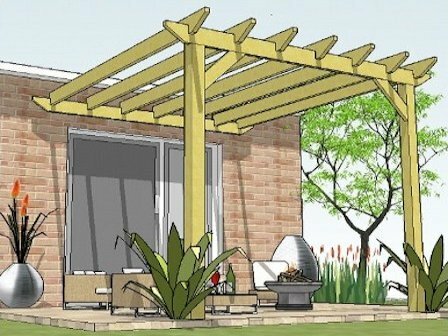 If you are thinking of building this particular pergola design and have questions about adapting or downloading the plans, take a look at the 'Corner Pergola Plans FAQs'. Continue reading "Corner Pergola Plans FAQs"
Spectacular plant combinations for a superb summer display! 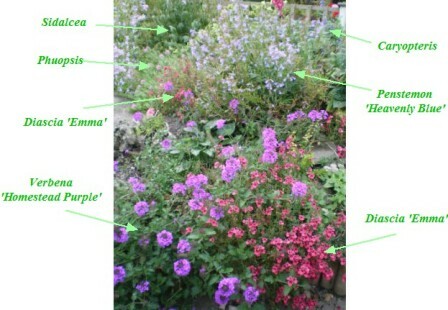 Continue reading "Spectacular Plant Combinations"